This is the first part of a longer piece discussing the particulars of the Obama/Duncan Race to the Top, a scheme developed by powerful people who deign to help your child to "outcompete any worker in the world." I live and teach in Bloomfield, New Jersey. Less than a block from the school, we have a shoe repairman. A few blocks north of the high school, we have Gencarelli's, a wonderful bakery, where you can still get in line before sunrise Christmas morning to get a loaf of fresh bread (which they boast on their website). In my neighborhood we have teachers and cops, postal workers and musicians. Next door on one side lives a nurse, on the other a professional caddy. We are home to Angelo's Pizzeria, owned by Charles Grande, who's in the Pizza Hall of Fame for winning the national pizza making championship several times. The Tripucka clan grew up here, Frank of NFL fame, his son Kelly, of NBA fame, and Dr. Carr, the Director of Pre K-6 Education here in Bloomfield, and who happened to score 56 points in a high school basketball game before her brother could even grow his famous moustache. I'm within a stone's throw of thousands of people who make a living making things, being useful to others, using their hands, doing work with job descriptions that do not need further explaining. They pay a lot of money to educate the children in our town. I'd bet none of the above (with the exception of Dr. Carr) had to prove a working knowledge of algebra to get where they are today, and I doubt even Dr. Carr uses the quadratic equation in her duties. You will find families that have been here for generations, more concerned about what's happening in the local schools and Little League than what's happening in Geneva, and despite our über urban sheen, Bloomfield still resonates provincialism. I know provincialism has a taint about it now, but the older I get, the less I understand why. I teach science here in town, but not as an outsider. I know that many, perhaps most, of my lambs can get through life just fine without grasping the intricacies of the DNA molecule, and more importantly, the students know this as well, poised to inherit a family business or take an inside track to an apprenticeship to learn something tangibly useful. Our school budget passed this past year despite a lot of hurting people, because, for the most part, our schools are still part of what makes our community a community. Any child in our town has the tools available to gain the education needed to get into schools like Stanford or Yale, and a few regularly do. Still, for most families, this is not a priority, nor should it be. My goals are to provide students the opportunity to see the world beyond their iPods, and to be able to critically analyze data, a fancy-pants way of saying helping them to think. Ultimately, I want our children to live productive, happy lives. What you won't find in my neighborhood is Bill Gates, or his assistant, or even his 2nd assistant to the assistant, though Mr. Gates is welcome to live here. He's not welcome, though, to dictate how education should be run in our town. He's all for "productive" lives, if productive means feeding the global economy. I'm not sure if happy fits into the equation. 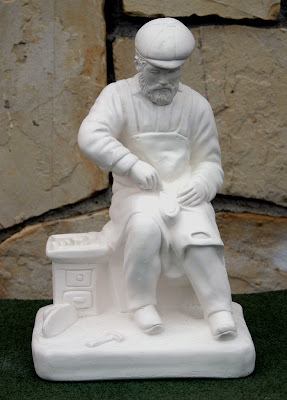 The Shoe Repair Man statue is from the Statuary Place Online Store, and can be bought for $12.95. Used with permission. What is the purpose of education? Is it to train with skills or is it about learning? Is it about both? Perhaps the highest meaning of an education is the ability to live a reflective life. Some skills are not perhaps economically useful. The GDP is blind to many kinds of creativity. People learn them because they are fun or expressive, having some personal value. These kinds of useless skills can sometimes eventually become someone's income. It feels like a kind of mechanical sympathy/empathy which we do not do so well usually. It comes from his thorough knowledge of materials and curiosity at how they can 'speak'. I feel the same way about architecture. That most modern architecture and building are the product of one kind of mind(architect), and a different set of hands(builder/fabricator). The projects made show a healthy disrespect for the conributions of the other discipline. Buildings are simple square, standardised, easy to communicate, efficient to make. They generally do not stretch what is possible with materials in the way that Antoni Gaudi did with his buildings and garden spaces. I feel we have lost a lot of the same kinds of latitude in social spaces, in learning, in working, in the way a crowd walks down a busy street. It is rarely a group of people enjoying the moment and the potential of their collective ideas and action. Michael Wesch can see the kinds of informal whimsy emerging on YouTube where people are forming digital moments and materials which are a celebration of their fun, expression and ability to use tools to reach beyond a publisher to the minds of other people. Post-industrial. Is it possible for this kind of empathic making to be something which helps us work better with our environment and this diverse web of life? There is something more respectful about making use of things found and using them gently. "Perhaps the highest meaning of an education is the ability to live a reflective life." You're onto something big. Developing this ability requires knowledge, critical thinking skills, and, at times, silence. For the Obama/Duncan team, the primary purpose of education appears to be a bit narrower than this. The Race to the Top of what? Our primary goal should not be producing children who can out-compete any child for a job anywhere else in the universe, even if such were remotely possible. I enjoy reading your blog because you reflect on values, on what matters. Jacques Ellul, a French sociologist, wrote a fascinating book The Technological Society back in the early 1960's, that reflects on (among many other things) the danger of efficiency and standardization in our culture. I suspect you'd like it. "It is the emergence of mass media which makes possible the use of propaganda techniques on a societal scale. The orchestration of press, radio and television to create a continuous, lasting and total environment renders the influence of propaganda virtually unnoticed precisely because it creates a constant environment. Mass media provides the essential link between the individual and the demands of the technological society." I just finished the final touches of my book about recovering what we lost in standardized education. As you mention Jacques Ellul it suddenly hits me that many of my ideas (though not my story or journey) are probably ripped off from his. I read that way back in high school and now it's hitting me that I was probably more influenced by that book than I realized. First, a HUGE congrats on your book! Everyone should go peek at your blog to get a sense of your words, always fun, always interesting. I am floored that you read Ellul in high school. Did you find him yourself, or was it part of the school['s curriculum?